We all do it when we are shopping for home services. We price shop looking for the best deal we can get. No body likes to over pay. At Chem-Dry of Tampa FL we understand that your looking for value without sacrificing quality. It's one of the biggest challenges in home services. 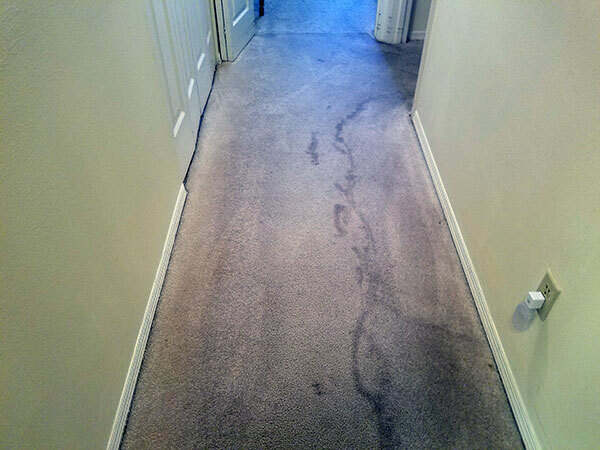 When it comes to carpet cleaning there is no reason that you can't find an affordable option without having to settle for lack luster cleaning. The picture above is from a recent carpet cleaning in Tampa FL. My customer had an extremely affordable, cut rate, carpet cleaner come in and clean here condo. A few days later these marks showed up in her carpet. I immediately recognized what happened to her carpet. The previous carpet cleaner finished cleaning the condo and then proceeded to drag his hoses out of the home. All the remaining dirty solution water and soap that was still in his hoses spilled out as he dragged the hoses out of the house, leaving a residue trail down the hallway. That sticky soap residue started to attract dirt right away. It doesn't matter how good of carpet cleaning job you do if marks like these just show up a few days later. Be careful when shopping for affordable carpet cleaning. If a deal sounds to good to be true it most likely is. I was able to remove these residue spots and they wont be coming back but they should have never happened in the first place.